I had been galloping horses for the Boniface family’s flat racing stable since I got out of high school. I knew the rules about not getting attached. But there was one little horse at work that I had really started to like. I mean like as a racehorse, of course—he was far too wild and too much a racehorse to be been a “regular” horse. Then, after he had run off with me, bucked me off, flat-out dropped me on my a** more time than I could count, I was in LOVE. I made sure I mucked his stall, fed him lunch, and gave him as many things as he’d eat (which was anything you’d give him). He tortured me on a daily basis. He would never jog on the racetrack, only shuffle, unless you were breezing on the grass. Only then would you get his fancy pony trot. His toes would be flicking so far in front of his face that you could see them. He loved his job and made me love mine. I had started riding jump races in the spring of 2013 and was set to make my first sanctioned start on Chris and Kevin Boniface’s big timber horse, Moonsox, at My Lady’s Manor in the stake. 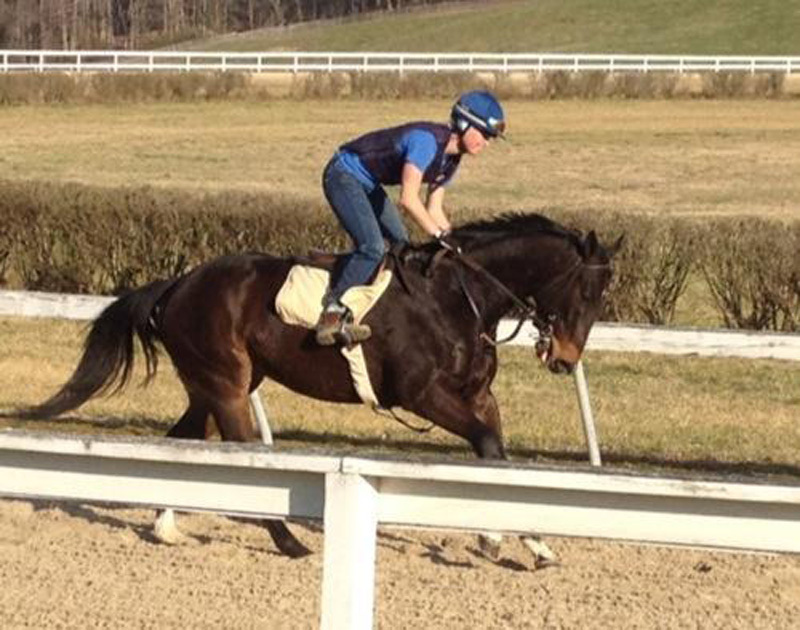 Marine was running at Pimlico the next day, also his first start of the season. So of course he was one I had to get on before I left for the races. I always had a lead home on Marine. It just saved us all from getting dropped as I would go squealing and bucking and jumping back down from the racetrack. That Saturday, for some reason, someone forgot to come to the track to lead me home. I knew he was in the next day so I HAD to stay on. We went jumping and bucking and squealing alllll the way to the barn, with Kevin yelling encouraging words on one behind me. All I could think was, “I have to ride a stake race in a couple hours and this horse is going to kill me and then get loose and kill himself.” Needless to say I made it to the barn doors and then he got me right in the face with his head or neck or something—I actually can’t remember. I was bleeding from my mouth and was MAD. After I got off of him in his stall Kevin came to inspect the damage; he didn’t think I needed stitches, which was good because I didn’t have time to get them before going to the races. My fat lip must have been a lucky charm because Mooney and I won the big race that day. It was one of the best days of my life. The next morning, like a true crazy horse person, I got up early and went to watch my little sister compete and then drove to Pimlico to run my big horse. He had run for a claiming tag a lot of times and every time before that he always came home. Not that day. USMC Semper Fi was claimed out of that race and I lost it. I have never cried when a horse was claimed. This was my horse—he was supposed to retire and come home with me. I went from the highest high to lowest low in a matter of minutes. 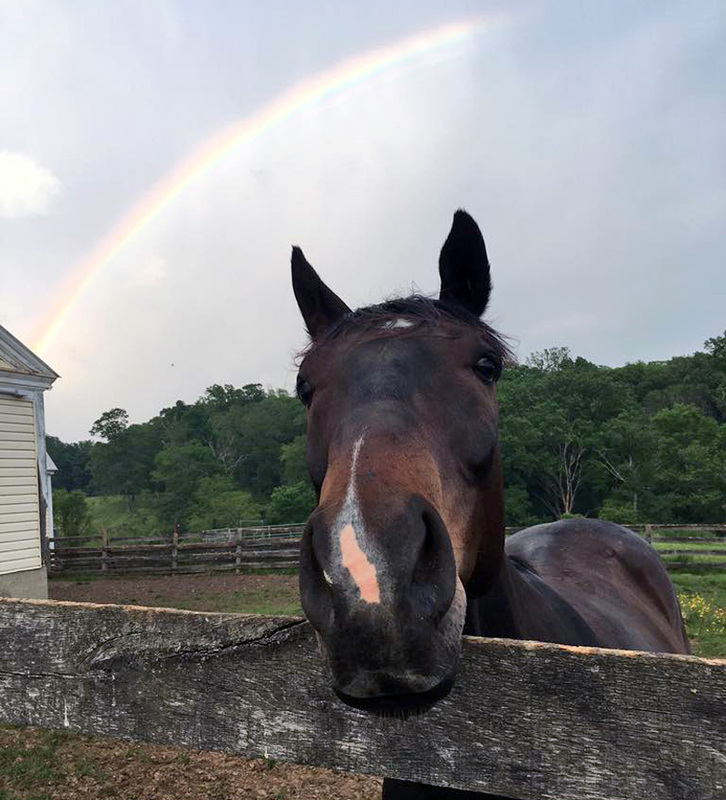 I had to say goodbye to my favorite horse in the barn. I had to go to work the next day and see his empty stall. I was heartbroken. I texted all of my people on the backside and made sure that they were keeping an eye on him. He ran a few times, not very well, and I started to get worried. He was entered at Timonium for $4,500. I was going to go get him. I was going to find the money and claim him back. “Luckily” I had to go to Monmouth with another horse that day, but got pictures and updates from a friend who was at Timonium. He, again, did not run well. The next week I was talking to my vet, who is also the vet at the track, and I was brave enough to ask him how my horse was after that last start. “Not great. They are looking to retire him I think,” was his answer. I grabbed a piece of paper out of his truck, wrote my number on it, and handed it back to him with the demand that he give it to the trainer and tell him to call me. The next day I got a text with the trainer’s number and was told to call him. When I got off of work I worked up the nerve to call. Thinking the worst, I talked to his trainer. Marine was swimming, and he told me to go get him, that he was mine. So I made two phone calls, the first to my mom, telling her to not ask any questions but I was bringing Marine home. The second to my grandmother to make sure I could borrow the truck and trailer for the afternoon. Within two hours of talking to his connections I had Marine back in my hands. I got him home. Finally, MY horse. I sent a picture to Chris and Kevin and within 30 minutes they were there to give him carrots and so Kevin could pull his hind shoes. I was the happiest person ever. I promised him he could do whatever he wanted. I did not care if I ever rode him again—all I needed was him in my barn. Luckily, he loves a job. He does anything I ask of him. He hunts, horse shows, events, swims, trail rides, ponies, hunter trials, anything. He lives off of air and is fat ALL the time. You hate to put him in a stall because he paws and bangs on everything until you give him treats, hay, feed, whatever it is he wants. 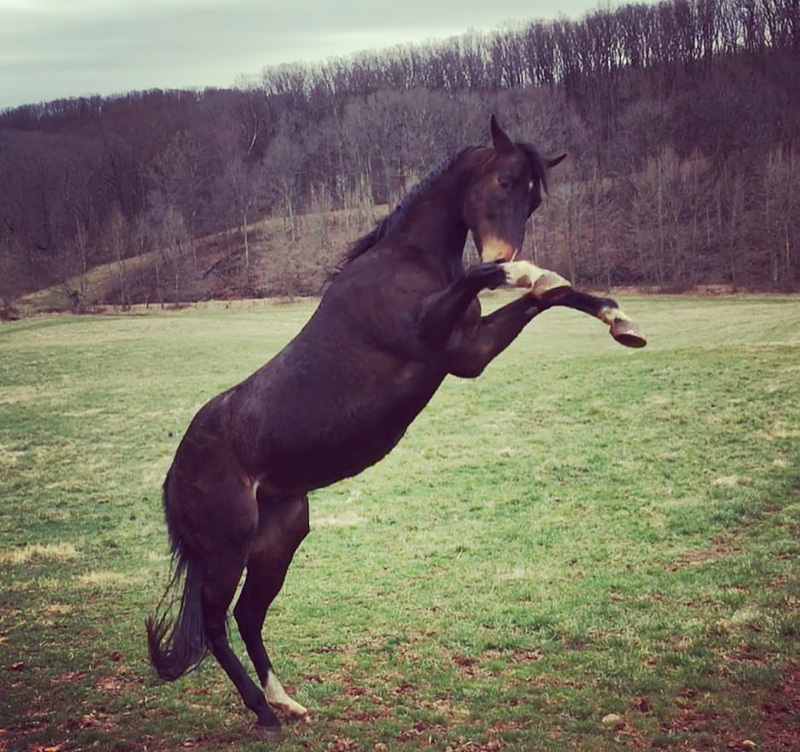 He thrives off the structure of horse shows—he thinks it’s fun to show off and flick his toes like he’s about to go work a half on the grass. 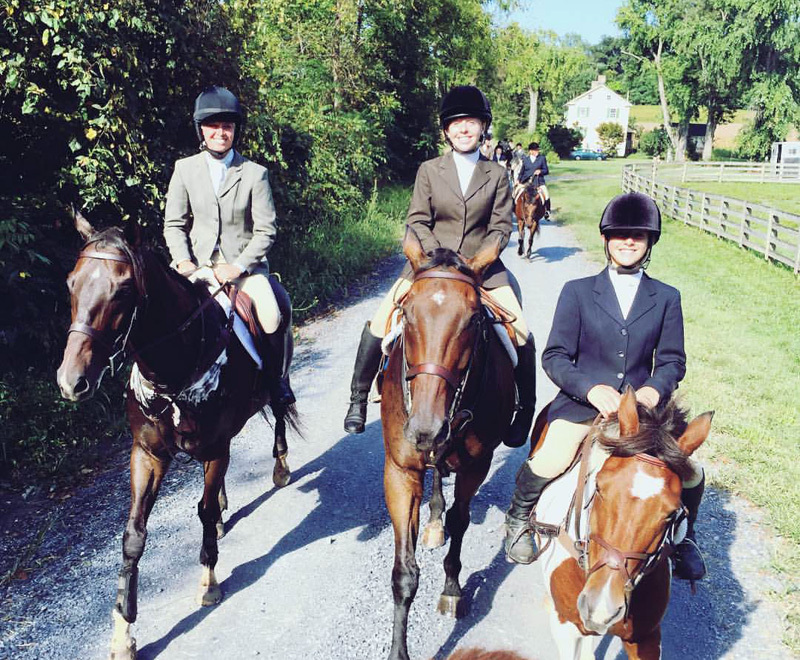 This year we were offered the opportunity to go to the Pennsylvania National for Hunt Night with the Green Spring Valley Hounds (Md.). 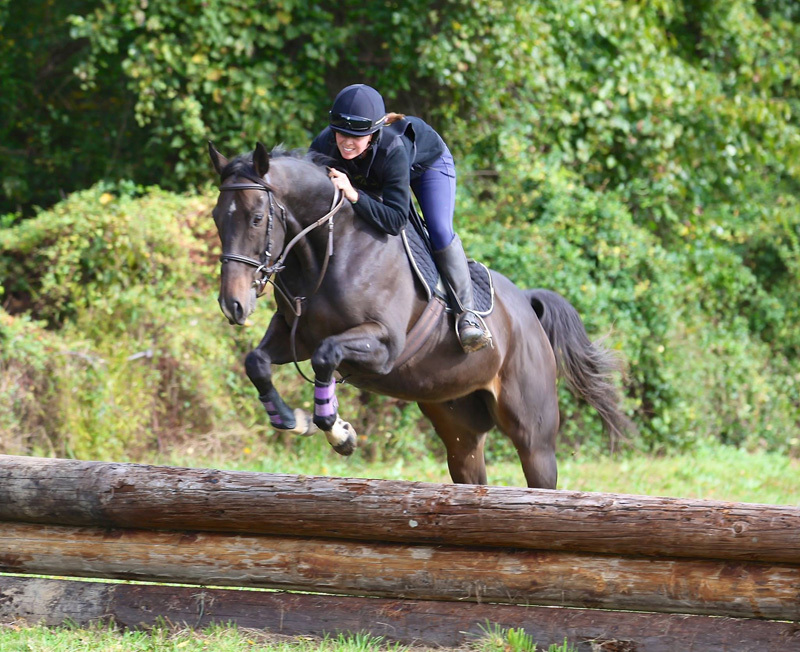 It has been on my bucket list for a long time—even as a snobby event rider who can’t stand the hunters! Ha! I always thought Marine would love to do something like that. I will probably be lost in the show ring and he probably won’t be perfect but we are going. We are going to represent our club, off-the-track horses, event riders, and all little girls who fall in love with their magical unicorns. Even if all their unicorn wants to do is buck them off. Here’s to a fun hunt night at Harrisburg with, USMC Semper Fi, my perfect pony!